← Happy Robbie Burns Day to ya! 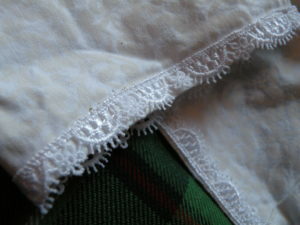 When we last saw our hero, she had finished sewing her Faire-going chemise, and was ready to add a touch of lace to the edges. With that done, she was ready to move on to making her other undergarments! I had every intention of making the corset next. But I wanted to get good boning for that project, and would have to wait for it to arrive in the mail before construction could be completed. I did cut out most of the corset fabric, but due to time constraints decided not to finish it for the Medieval Faire. The boning has been acquired, though, so I’ll tell you all about that when I actually sew the garment. So here I am, chemised, ready for the rest of my costume! 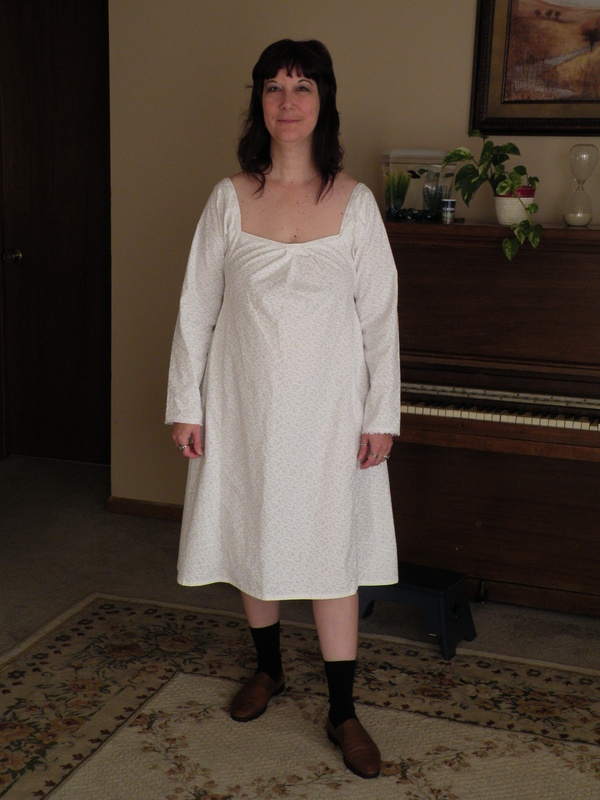 Because the neckline was so wide, the chemise kept slipping off my shoulders. So I put my little tube of sock glue to good use! A dab of that on my skin, then pressing the shoulder of the chemise down on the glue did the trick! Ohohoh, one other note on the chemise. If you are using Simplicity pattern 2621 for your chemise, I would suggest making the facings quite a bit longer than the pattern calls for. You won’t be able to add much to the sides since you’ll run into the arm area, but adding a couple of inches to the front and the back would help keep them tucked in neatly. As you can see I put my shoes on first, as I knew my feet would soon be hard for me to reach. On faire shoes: I spent a lot of time tracking down the most perfect medieval shoes, searching thrift stores far and wide. I ended up with a pair that I was *very* happy with the looks of, but they were a bit pinchy in the toe. I used a wonderful idea found on YouTube to stretch them out: Mix one part isopropyl alcohol with three parts water. Spray this on the leather shoes until well moistened, and wear the shoes until they are dry. The problem came to be that with all of that effort, the shoes were negligible. You see, once I got my big long skirt on, my shoes never showed. Not once. Ok, well once when my friend Kelly asked what kind of shoes I was wearing. She agreed that they were perfect! And for $3.50 I’m not complaining, especially since they didn’t hurt my feet at all even after wearing them tromping around the fairgrounds all day long. But next time, I won’t be quite so picky about what shoes I’m wearing.